Oak Knoll School of the Holy Child is a Catholic independent school, coeducational from kindergarten to grade 6, and all girls in grades 7 to 12. Oak Knoll’s mission since its founding in 1924 has been to cultivate intellectual, spiritual, physical, and emotional development in all of our students. Students, along with their families, experience academic programs that encourage excellence in each student, a strong faith commitment, respect and reverence for each person, freedom of expression through the creative arts, a competitive athletic program, and active involvement in campus ministry opportunities that expands their understanding for the global world in which they live. The Sisters of the Holy Child Jesus have schools in England, Ireland, France, Nigeria, and Ghana. All Holy Child schools operate under the American Province Society of the Holy Child Jesus, based in Rosemont, Pennsylvania. Oak Knoll shares the goals of the Schools of the Holy Child Jesus. Grounded in our 150-year heritage and influenced by the unique challenge of educating children for the 21st century, our Goals heed Cornelia Connelly's admonition to provide an education which "meets the wants of the age." The following Goals have been developed collaboratively by Holy Child educators. They are principles by which we teach children and, in doing so, perpetuate our tradition. The trustees, administrators, faculty and staff commit themselves to educate by these principles and to lead our students to embrace these values for themselves. Average grade size in grades 7 to 8 is 34 to 36. Beautiful 11-acre campus in Summit, New Jersey. The Class of 2018 Profile includes key facts about Oak Knoll and highlights grades and test scores, along with other academic data collected from the Class of 2018. All elementary school classrooms have 32-Point Touchscreens and video/DVD players. A state-of-the-art I.D.E.A.S. Lab (makerspace) allows students in kindergarten through sixth grade to focus on innovation, design, engineering, art and science in the Lower school. Oak Knoll’s robust technology curriculum boasts a Genius Hour, enhanced coding, Wonder Workshop K-12 with additional challenge packs for Dot and Dash robots, app-building curriculum, Swift Playground from Apple for iPads, and CoSpaces for creating virtual environments. In the Upper School, state-of-the-art computer labs in middle and high school are equipped with the latest software and equipment, including scanners, laser and photo printers, visual presenter/document camera, digital cameras, and video cameras. 100 percent of our students participate in community service and outreach projects through Campus Ministry. This includes students in our coed, private, Catholic kindergarten through our all-girls high school in grade 12. Students and faculty serve at numerous agencies in the area during schoolwide service days and support many outreach projects on an ongoing basis. Our families come from more than 68 surrounding towns and reflect a broad diversity of socioeconomic, ethnic, and religious backgrounds. We offer several transportation options to travel to Oak Knoll. The fine and performing arts provide a broad array of creative experiences aimed at cultivating the whole aesthetic of each student, from our coed, private kindergarten through our all-girls high school in grade 12. Our Mother Mary Campion Center for the Performing Arts holds approximately 500 people and houses musicals, concerts, plays, assemblies, and campuswide prayer services. One hundred percent of our all-girls high school graduates attend college. 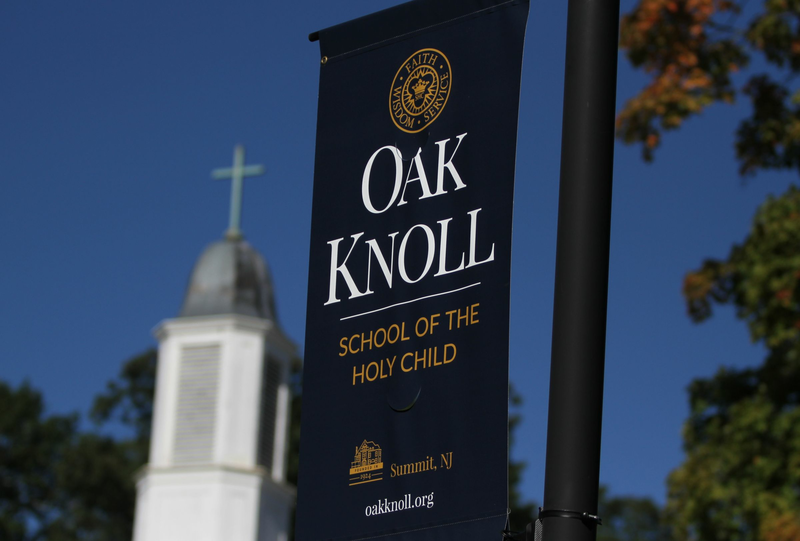 The college admissions process has become increasingly competitive, and Oak Knoll offers a full time college counseling staff to ensure that the process remains personal and focused on each student’s strengths and needs. We offer 17 advanced placement courses to our Upper School students. The Bonaventura Hall Library (K-6) houses more than 11,000 books, circulates more than 650 multimedia materials to support curriculum, and offers a variety of print and electronic resources and a SMART Board teaching center. The Hope Memorial Library for our all girls middle and high schools (grades 7-12) houses approximately 15,000 volumes, as well as newspapers, magazines, music CDs, audiobooks, and DVDs.